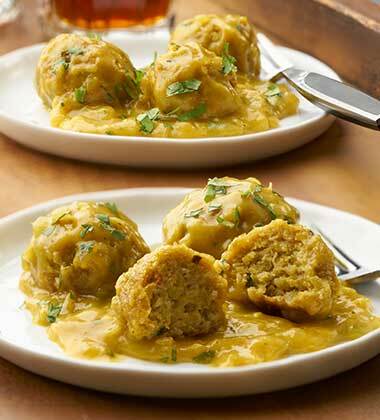 Curried chicken mini meatballs are heated in a creamy chicken curry-chutney dipping sauce made with Campbells® Cream of Chicken Condensed Soup. ground red pepper	 0 1/4 tsp. 1. In a bowl, mix chicken meat, panko, chives, egg, curry, salt and red pepper. Mix well. 2. Spray sheet pan with non-stick spray. 3. Using a #60 scoop portion 1 tablespoon of meat mixture to form meatballs. Place on sheet pan and bake in 350°F. oven for 15-20 minutes, Remove from heat and cool. Reserve. ginger root, grated	 1 oz. 3 tbsp. lime zest, grated	 2 tbsp. 4. In a skillet, heat oil over medium-high heat. Add onions. Sauté 6-7 minutes, or until lightly golden. 5. Stir in garlic, ginger, curry powder and ground red pepper. Ccontinue to cook 2-3 minutes, stirring often. 5. 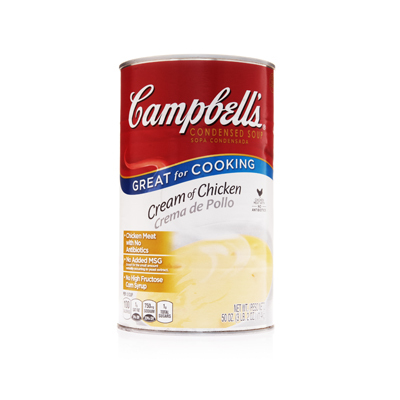 Mix in Campbells® Cream of Chicken Soup and coconut milk. Bring to a simmer. 6. Stir in chutney and salt. Return to a simmer. 7. Stir in lime juice and zest. Reserve. 8. Stir chicken meatballs into sauce and bring to a simmer. Mix in cilantro. 9. To serve, using a slotted spoon portion 3 meatballs onto plate. Using a #12 scoop, top with 1/3 cup sauce. Serve immediately. ginger root	 1 oz. 3 tbsp. If chicken meatball mixture is too wet, use more panko breadcrumbs.